If you have vehicles, tools, garden supplies or other valuable assets that are important to you, leaving them out in the open isn’t always the best idea. Shed City’s sheds and garages are the perfect solutions for keeping your valuables safely locked away and giving you complete peace of mind. 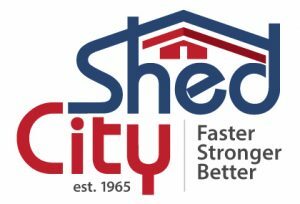 All of Shed City’s sheds and garages are made with the best quality materials with strength and durability in mind. Even with a lock on your garage door, if the materials aren’t strong, an intruder may still be able to break in with enough force. The roller doors we use at Shed City are made with strength and safety as a key aspect. The standard door is supplied with a centre lift lock and you have the option of a remote unit for authorized opening with the touch of a remote control button. Gererally roller doors are notoriously difficult to break into from the outside so, consider roller doors for your next shed or garage. If you already have a garage that’s being used to keep your vehicles and tools safe, you may not have enough space to neatly store your garden tools and other household odds and ends. That’s where a garden shed can really come in handy. Garden sheds by Shed City are strong, sturdy and make the safest and most convenient space for your odds and ends. All Shed City’s sheds and garages are completely customizable to your specific needs so, if you live in a high crime area, you have the ability to add any extras you feel necessary for safety such as locks and reinforcements. Talk to us about our innovative security upgrade pack. For more information about our sheds, carports and garages, visit our display at Kilmore or click here to get in touch.